Florida had seen just 17 confirmed fatal alligator attacks in the previous 58 years. In less a week, there appears to have been three. The bodies of two women were found Sunday some 130 miles apart. A third woman's body was found on Wednesday. Annemarie Campbell, 23, of Paris, Tennessee, was attacked while snorkeling in a secluded recreation area near Lake George, said state wildlife spokeswoman Kat Kelley. The lake is about 50 miles southeast of Gainesville. "The people she was staying with came around and found her inside the gator's mouth," said Marion County Fire-Rescue Capt. Joe Amigliore. By poking the alligator's eyes and trying to open its jaws, the men were able to free Campbell's body, but she was already dead, the Ocala Star-Banner reported. Her stepfather, who had tried to help her, was treated on the scene for a hand injury. "You just don't think of your daughter dying from an alligator," Campbell's mother, Dawn Marie Yankeelov, told the newspaper. Authorities estimate the animal was 7 to 9 feet long. In Pinellas County, the body of another woman apparently killed by an alligator was found in a canal 20 miles north of St. Petersburg, authorities said. Judy W. Cooper's body had been in the water for about three days, authorities said. The 43-year-old Dunedin woman suffered animal bites that were consistent with an alligator, which "did play some part in the victim's death," according to a preliminary autopsy. The cause of death was pending and the medical examiner's final report will not be released for at least four weeks, the sheriff's office said. "We don't know the condition she was in when this happened," state wildlife spokesman Gary Morse said. It was not immediately known why Cooper was in the area, where wildlife officials said alligators are frequently spotted. Cooper's family had not heard from her for about three months and she had a history of drug abuse, her sister, Dannette Goodrich, told The Orlando Sentinel. Gary Goodrich, Cooper's brother-in-law, told the newspaper that officials said her purse was found near the water and drugs may have played a factor. Authorities were baiting traps in their searches for both alligators Sunday. On Wednesday, construction workers found the dismembered body of a Florida Atlantic University student in a canal near Fort Lauderdale. A medical examiner concluded that Yovy Suarez Jimenez, 28, was attacked as she was jogging near the canal bank and dragged into the water. On Saturday, wildlife officers captured an 9-foot, 6-inch (2.85-meter) alligator in Sunrise that they believe fatally attacked her. 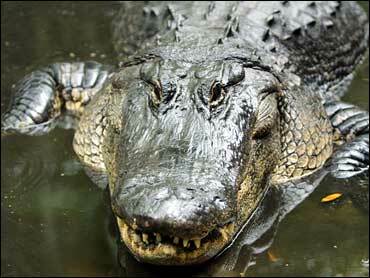 Suarez's death was the 18th confirmed fatal alligator attack in Florida since 1948. Nine other previous deaths are unconfirmed, mainly because it was not clear whether the person was already dead when the alligator attacked. What provoked the attacks in three separate Florida counties was unknown, but state wildlife officials said alligators are generally on the move looking for mates and food this time of year. "As the weather heats up, the alligators' metabolism increases and they have to eat more," Florida Fish & Wildlife Conservation Commission spokesman Willie Puz said Sunday. "They might be moving more, but that just shouldn't mean increased alligator attacks." Florida residents are warned not to swim in heavily vegetated areas, feed wildlife or walk pets near the water, especially between dusk and dawn when alligators are more active, Morse said.